Performers include: Jon Walmsley, Mary Beth McDonough, Eric Scott, Judy Norton-Taylor, David W. Harper, Kami Cotler, Ralph Waite, Joe Conley, Michael Learned, Will Geer, Ellen Corby, Richard Thomas, Ronnie Claire Edwards, Mary Jackson, Helen Kleeb, Michael Reed, Marshall Reed, Leslie Winston, John Crawford, Peggy Rea, Nora Marlowe, Tom Bower, Robert Donner, John Ritter, Keith Coogan, Martha Nix, Lynn Hamilton, Robert Wightman, Mariclare Costello, Rachel Longaker, Merie Earle, Victor Izay, David Doremus, Lewis Arquette, Cindy Eilbacher, Wilford Brimley, James Gammon, Art Gilmore, Dorothy Shay, Llynn Storer, Peter Fox, Tony Becker, Claire Schoene, Elizabeth Schoene, Tammi Bula, Hal Williams, and Earl Hamner Jr. (as the adult John Boy and narrator). TV show description: Based on the Spencer’s Mountain book by Earl Hamner, Jr. and a 1963 Henry Fonda movie of the same name, this drama revolves around a large family living in rural Virginia during the Depression and World War II. 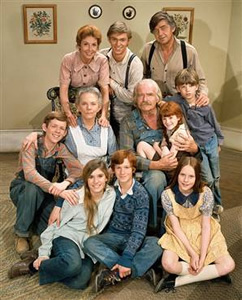 The family lives on Walton’s Mountain and is made up of John and Olivia Walton (Ralph Waite and Michael Learned), their seven children, and John’s parents, Zebulon “Zeb” and Esther Walton (Will Geer and Ellen Corby). The story is seen primarily through the eyes of John “John Boy” Walton, Jr. (Richard Thomas, later Robert Wightman), an aspiring writer and the eldest son. The other children are introverted musician Jason (Jon Walmsley); rebellious Mary Ellen (Judy Norton-Taylor); pretty Erin (Mary Beth McDonough); schemer Ben (Eric Scott); slow-witted James Robert “Jim-Bob” (David W. Harper); and sensitive Elizabeth (Kami Cotler). The mountain setting is also home to several other townspeople like the moonshine-producing spinsters, the Baldwin sisters (Mary Jackson and Helen Kleeb); general store owners Ike and Cora Beth Godsey (Joe Conley and Ronnie Claire Edwards); hard-working African American Verdie Foster (Lynn Hamilton); and undermotivated chicken thief Yancy Tucker (Robert Donner). As the series goes on, the Walton family grows through weddings and births. Hamner narrates the opening and closing of each episode, portraying an adult John Boy Walton who is recounting his family’s past. The Christmas movie pilot, The Homecoming: A Christmas Story, preceeded the series and aired on December 19, 1971. Some of the character were played by other actors. They include Andrew Duggan (John Walton, Sr.), Patricia Neal (Olivia), and Edgar Bergen (Grandpa). John-Boy goes to New York to pursue his writing career but arrives to find that his manuscript has been rejected. His publisher’s secretary gives him enough money to return home and advises him to start a new book. He returned home dejected. Meanwhile, the Baldwin sisters plan a lavish ball and send out invitations to their many old friends. Most are returned because the people have all died or moved away. The Waltons end up saving the day when they gather everyone they can find to attend the celebration. First aired: June 4, 1981. After the series ended, the cast reunited for a total of six made-for-TV movies. There are no plans for any additional reunions at this time. I would like to know what did Virginia Walton, Ginny, died from and why?? All we know is that Ben and Cindy had 2 children, Virginia and Charlie, the in a Thanksgiving episode, they have none. I think you’re remembering “A Walton Thanksgiving Reunion” movie from the early 1990s. Ginny was said to have drowned. They may edit that bit out to make more room for commercials in syndication. I don’t think they ever mentioned Charlie. I absolutely love the Waltons tv show. As a matter of fact I couldn’t grt enough on tv so I bought the whole set on dvd and I watch it whenever I want to. The Waltons sort of used to be an escape for me. The bad times as a child I had, my escape would be to watch and pretend I was also with the Walton Family. The family that I wished I had. Mary Ellen’s husband Curt was killed at Pearl Harbor. In a later episode he reappeared. The story lines did not match up with these 2 episodes. Were they running out of stories by the time the later episode was written. When Curt reappeared, another actor replaced Tom Bower, both were left handed, this was an obvious move. The whole idea was “war wounds” take on a many changes in one’s personality leaving someone a changed individual.